Less than one week ago, KeepUtahFree.org posted an article “GOP Chair Pulling A Fast One To Dissolve the SCC at Convention? . . .” expressing concern that Chairman Anderson, or his fellow Buckshot elites, might try to dissolve the State Central Committee (“SCC”) at the State Convention. Despite being accused of being conspiracy theorists, it turns out our concerns were well founded. The deadline for submitting Constitution & Bylaw (“C&B”) amendment proposals for the upcoming State Convention was May 22, 2018 @ 5pm. Up until 3pm on May 22, the Chair of the C&B Committee had access to the system where proposals were being submitted. Mysteriously her authorization was revoked just hours before the deadline. Repeated requests were made of the Chair to release all the proposals, but he did not fulfill the requests. The C&B Committee has to act quickly after the deadline to determine which proposals go to the State Central Committee and which proposals go to the State Delegates, and notify the delegates accordingly so delegates have adequate time to vet the proposals. Why wasn’t the Chair releasing the proposals? What was he trying to hide? The public pressure caused by KeepUtahFree’s article resulted in Anderson exposing the nefarious plan. View Delegate Amendment Voting Guide, as well as more info about the State Convention here. Before releasing proposals to the C&B Committee, Anderson disregarded the procedures outlined in the governing documents and usurped the authority form the C&B Committee by emailing all proposals to the State Delegates himself. In the email, Anderson insists that all proposals be voted on at Convention, which is unreasonable because doing so would take hours, and detract from candidate nominations. After denying the C&B committee the right to distribute amendment proposals properly, Anderson finally released ALL BUT ONE proposal to the Committee. 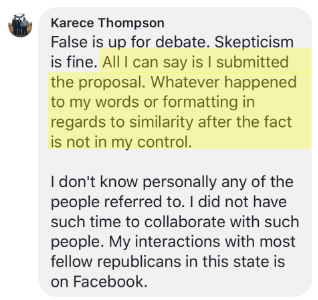 Among those received, the committee quickly discovered two proposals (one from Karece Thompson & one from Carolina Herrin) that were designed to gut, dilute, and obliterate the State Central Committee as we now know it. Chairman Anderson’s circumvention of the bylaws demonstrate his complicity in the ruse. Buried in the 17 amendment proposals sent by Anderson to the delegates was a third SCC-wrecking amendment that Anderson NEVER FORWARDED TO THE C&B COMMITTEE. It’s suspected Chairman Anderson’s strategy here was to put this 3rd amendment on the Convention agenda by claiming the C&B Committee never made a decision on it. The 3rd amendment proposal was the worst of all and was submitted by Buckshot-Caucus-Member Diane Christensen. Carolina Herrin–member of Buckshot Caucus–who recently attended the Buckshot Caucus Suite at the Jazz game in January 20, 2018 where Todd Weiler initiated his attempts to extort GOP Donor Dave Bateman. Ms. Herrin’s proposal immediately and retroactively expels all State Central Committee members having spent more than 10 years on the Committee. This would allow a special SCC meeting to quickly be convened before counties could replace the expelled members, and bylaws could be completely changed by the disproportionately liberal SCC members remaining. Christensen’s amendment proposal immediately kills 37 of the more conservative State Central Committee positions, leaving approximately 140 members (depending on the number of approved auxiliaries). Most of those lost seats come from Utah’s largest counties (e.g. Salt Lake, Utah, Weber, Davis, Iron, & Washington). This provision would give Salt Lake County with a population 1,029,665 the same voice on the State Central Committee as Daggett County with a population of 1,059. Why in the world would Buckshot advocate for this change? Because they can manipulate the results of Daggett County much easier than Salt Lake County. The proposal allows 20 members to hold a vote outside of a State Central Committee meeting to vote off the 58 remaining at-large State Central Committee members. Yeah, so 14.2% of the SCC can vote unilaterally can oust 41% of the SCC, and the 41% don’t even get to participate in the vote. Historically 61% of SCC Members attend any given meeting. That means out of 140 remaining numbers, 85 members would attend a typical meeting. Christensen’s proposal would require 50% (70 members) to attend a meeting in order for business to be conducted. This means that a rogue chair who wanted to shut down the Party’s ability to conduct a meeting would only have to talk 15 additional people into staying home to prevent business from being conducted. Click here to see how Rob Anderson has already attempted this repeatedly. Prevents a member of the State Central Committee from serving more than 2 terms (except for unelected political leaders of course who can remain endlessly). Do These Proposals Have The Same Author? After being confronted with the mathematical probability (less than 1 in 20 trillion) that his amendment proposal would mysteriously be worded the same as the other SCC-wrecking proposals, coupled with his inability to defend or even explain the mechanics of his proposal, Karece buckled and admitted he in fact did not write the proposal. All three proposals have obvious ties to buckshot Caucus who has been slowly undermining the Utah GOP for years. The only plunder remaining for Count My Vote / Buckshot Caucus is the State Central Committee. The SCC is the only thing standing in the way of Count My Vote obtaining complete control over Utah politics. They will stop at nothing to destroy the SCC. Could the State Delegates Really Be Duped Into Destroying the SCC? A major effort has been underway in the Utah GOP to deceive, confuse, and mislead GOP members and delegates into thinking a small minority of State Central Committee members (the gang of 51) are using guerrilla tactics to seize control of the SCC. Nothing could be further from the truth. A survey of SCC members was commissioned and taken in January of 2018. 101 members out of 140 members who took the survey are in favor of a single-path Caucus Convention System. As evidence, the following video demonstrates the overwhelming resolve the SCC has to carry out the SB54 lawsuit. 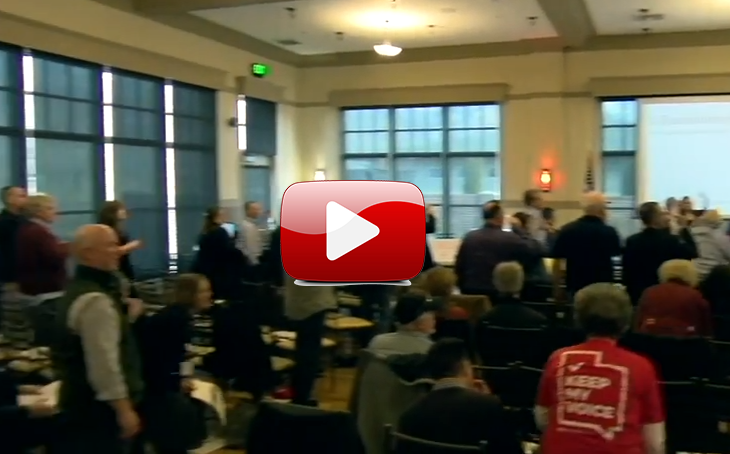 This video is taken during a regular SCC meeting on January 27, 2018 where 129 members of the State Central Committee were credentialed. Notice only 3 people vote to drop the lawsuit. Kathleen Anderson, Daryl Acumen, & Dana Goff. First, approximately 46 SCC members are required to call a special meeting. Just because 51 members called a meeting, doesn’t mean only 51 support the agenda in the meeting. The media is squarely behind the effort to destroy the caucus-convention system because they have everything to gain from its demise. Consequently, the media has joined up with the small, radical, Buckshot-Caucus contingent to spin the mainstream SCC into appearing radical. The media will make millions of dollars because of all the new primary elections carried out as a result of SB54. Moreover, primary voters are heavily influenced by the media, giving the media a huge say in the outcome of Utah’s elections if SB54 stays in effect. The media is utterly biased and cannot be trusted. 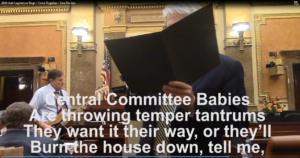 Daryl Acumen produced a short video where contents were completely taken out of context in an attempt to falsely depict conservatives in a quarrelsome SCC meeting during the January 27, 2018. 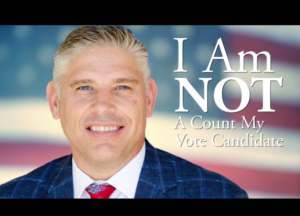 The video falsely depicted the State Central Committee as being overly aggressive and bullying toward Chairman Anderson. Nothing could be further from the truth. Acumen then email spammed a massive contingent of Utah Republicans to mislead them regarding the “gang of 51”. Acumen set up two emails kmv@utahgop.org and gangof51@utahgop.org and sent tens of thousands (possibly hundreds of thousands) of emails to Utah Republicans asking them to swarm kmv@utahgop.org and gangof51@utahgop.org inboxes. Here’s the catch: Acumen set these emails up so every time someone emailed these inboxes, it would relay the responses to each conservative member of the SCC that Acumen was targeting, resulting in these individuals being harassed by nearly 1,000 emails each. It massively interfered with their ability to prepare for Caucus night on March 20th. Some even mentioned it interfered with the jobs and livelihoods. Watch the distorted video from Daryl Acumen painting the “Gang of 51” as extreme. The Sargent in Arms Chairman, Jim Phelps, who Anderson asked to remove SCC member Layne Beck from the meeting publicly acknowledged it was Chairman Anderson who was out of order because he failed to acknowledge Layne Beck’s Appeal From The Ruling of The Chair. State Central Committee members are not extreme, but rather are resisting an intransigent Chair who breaks every rule, and deceives at every opportunity. KeepUtahFree.org encourages all delegates to reach out and get to know your county’s State Central Committee members. You probably learned by now that you can’t trust Daryl Acumen or Rob Anderson, so don’t buy into their “gang of 51” nonsense. 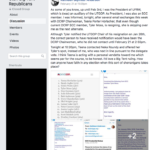 At 2:50pm on January 26th, Tyler Moss, a resident in Davis County, sent an email to UTGOP Chairman, Rob Anderson, resigning his seat on the SCC (State Central Committee) due to “a service position in [his] church that will be taking quite a lot of [his] spare time.” A few minutes later he received a call from the Chairman. Following this revelation, and Moss’s request that his resignation take effect on January 26 (his original resignation date), the seat was offered to Neka Roundy. Roundy was the next eligible person by order of election who was not already a member of the DCRP SCC. On February 24th, at a Special SCC meeting held at Entrata in Lehi, the group went into an Executive Session to discuss issues and concerns privately. Video footage was later leaked and posted to the YouTube Channel of Daryl Acumen. We have included audio from a small portion of that meeting at the end of this article. 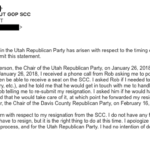 About two minutes after Chairman Rob Anderson made the statement, “I’ve never intervened or done anything with respect to Davis County,” he was addressed by UTGOP Secretary, Lisa Shepherd, who had received a copy of the statement from Mr. Moss, shown above. 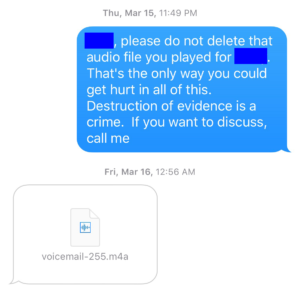 Was Todd Weiler’s creepy voicemail an extortion attempt, or just one gigantic mis-understanding? 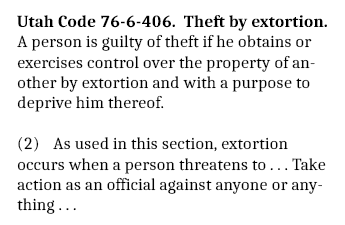 Utah Criminal Code Section 76-6-406 shows that extortion occurs when an official takes action against someone in an attempt to exercise control over his or her property. So in order to know if Todd Weiler extorted Entrata owner Dave Bateman, we need to know what his motive was in leaving the voicemail included above. 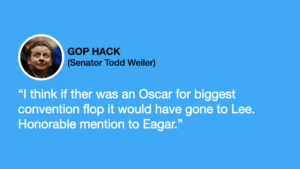 If Todd Weiler’s voicemail was politically motivated, this is a clear-cut case of extortion. 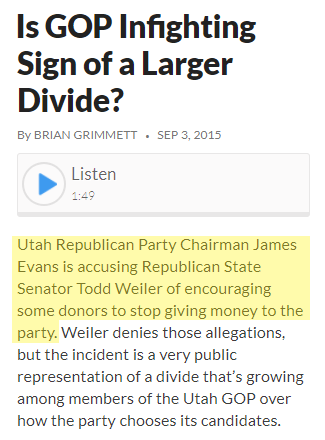 Why would Senator Todd Weiler want to extort David Bateman for political reasons? First, watch the video to the right to learn that Weiler is an outspoken proponent of SB54, a law that forced the Republican Party to permit candidates to gather signatures to access the primary ballot, and bypass GOP Convention. Ok, so Todd Weiler clearly had a motive to attack a donor who stepped forward to fund the SB54 litigation. If he could scare off Bateman and his contributions by attacking him politically, perhaps he could keep the SB54 suit from being funded. How Did Dave Bateman end up in Weiler’s Cross Hairs? 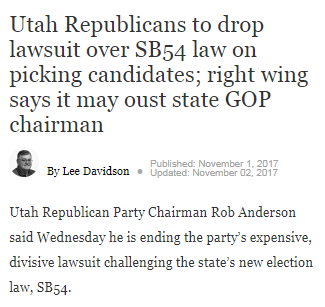 On November 1, 2017, Utah GOP Chairman Rob Anderson announced he would unilaterally drop the SB54 lawsuit just 45 days after the State Central Committee voted to continue the lawsuit, and after Anderson campaigned for Chairman promising State Delegates that he was “not A Count My Vote candidate”. Anderson’s unilateral move was made just a month and a half after a motion failed during the September 9, 2017 State Central Committee Meeting to drop the suit. Keep in mind that Todd Weiler became close personal friends with Chairman Anderson’s wife while they were in college. Many report that Chairman Anderson entered politics at the behest of Todd Weiler, and that Anderson may actually be doing Weiler’s bidding in his role as Chairman. Dave Bateman learned about Chairman Anderson’s attempts to unilaterally drop the SB54 lawsuit, citing a financial motive. The financial motive stated by Anderson was laughable to Bateman, because the Party wouldn’t incur another dime of legal cost while waiting for the 10th Circuit Court of Appeals to rule on the case. A win from the 10th circuit meant that all the GOP’s litigation costs would have to be reimbursed by the State. Bateman compares the situation to a lottery ticket. The ticket had been purchased. “Rob Anderson wanted to toss the ticket in the trash without scratching off the sliver cover to find out if we won.” says Bateman. Knowing Anderson’s motives weren’t pure, he stepped up and offered to (a) pay the litigation costs going forward, and (b) attempt to settle the bank debt owed by the Party to its attorneys (which he has since done). Bailing out the Party from its legal debts, unwittingly placed Bateman in the cross hairs of Utah Senator Todd Weiler, who was attempting to block funding to the Party. Weiler’s family friend at the Buckshot Caucus Suite at a Jazz game was questioned aggressively about Bateman. She told Todd Weiler at the game that once Bateman and his girlfriend broke up, Bateman’s girlfriend was moved to a different team. That’s when the lightbulb went off for Weiler that maybe he could use both these women to initiate a legal attack against Bateman. Weiler tried to initiate communication with Bateman’s ex-girlfriend to convince her to bring allegations against him. Bateman’s ex-girlfriend reported to police that she was not looking for an attorney, nor did she ever even respond to Weiler’s $1,000,000 offer. Instead she warned Bateman that political figures in Utah were trying to do him harm and get her to sue him. Weiler’s family friend was urging Bateman’s ex-girlfriend to change her behavior and not go on a trip with him, otherwise she wouldn’t get her million dollars. Weiler’s family friend told Weiler that “They are in a good place”, yet Weiler tried to encourage the fraudulent lawsuit anyway. Weiler’s family friend refers to Weiler’s questioning at the Jazz game as “Hungry Attorneys”. However, Bateman has produced a text message to the right shows that Weiler’s family friend actually sent Bateman a text message containing the voice mail at 12:56 am, and has notified this to the police. Bateman never visited her home uninvited as Weiler claimed, and he never demanded she hand over her phone. After Weiler says the woman reached out to him, he admits that he actually invited her to the Buckshot Caucus Suite at a Utah Jazz Game. First, Bateman’s ex girlfriend confirmed to police that she was NOT looking for an attorney, and she never had any intention of filing a sexual harassment claim against Bateman. Second, Weiler’s close family friend confirmed that during her first conversation with Weiler on the subject she told Weiler “They are in a good place” and even referred to Weiler and his associates as “Hungry Attorneys”. Third, Weiler himself admitted inviting this woman to the Buckshot Caucus suite on January 20, 2018, but has the audacity to state that she “sought him out” to help a co-worker. Fourth, Weiler was baiting the ex girlfriend with a million dollars to alter her behavior and not go on a trip with Bateman, even though the woman refused to talk to Weiler even a single time. First, Bateman claims to have over 100 witnesses that he met his ex girlfriend at Lake Powell over Memorial Day in 2017, months after his divorce was finalized, and years after his initial separation. Second, Bateman and his ex-girlfriend were dating exclusively long before she ever came to work for Entrata. If Weiler really was providing legal advice to someone looking for it, client-attorney confidentiality requirements would never allow him to go public like he has with these ridiculous and false allegations about the very woman Weiler is purporting to be protecting. These public statements are evidence that no one ever sought him out or engaged him to help with legal representation. Weiler then includes in his comments to Utah Policy “I am troubled that Mr. Bateman would release a voice message that confirms he was traveling to Europe with a subordinate as it does not reflect well on Entrata, Mr. Bateman or the woman involved. It could also open up claims of other employees who are not treated the same at work as this woman.” In typical Weiler fashion, not only does Weiler continue to lie about Bateman, but he also makes a call to investors at Entrata to go after Bateman, as well petitions other women at Entrata to make contrived allegations. The evidence is overwhelming that Weiler was attempting to use these women to make a political attack on Bateman, not to help them as Weiler suggests. Weiler approached the woman’s high-school age daughter and made her feel uncomfortable while backstage at the State Convention. Weiler contacted the parents of her kids’ soccer team to make negative comments about her. Weiler made contact with her estranged sister who lived in another state, presumably to harass her and dig up dirt on her. Weiler’s friend warned her that Weiler had the money and influence to bring down her life. 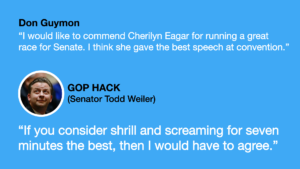 Weiler trashed her name so bad that she believes she could never run for any office in Utah again. 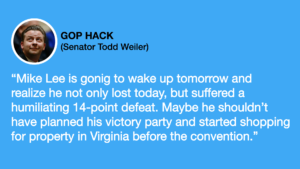 Reported that Weiler and Carrie Dickson collaborated to cheat at Convention to keep her from winning (she lost by one vote). Other Buckshot Caucus members posted nasty things about her online. During the 2010 election cycle, Todd Weiler admitted to creating a fake online profile, called “GOP Hack” to say nasty things about candidates in the 2010 election cycle. 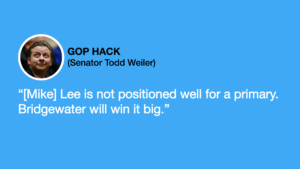 His primary target was Senator Mike Lee, but others were attacked by him. 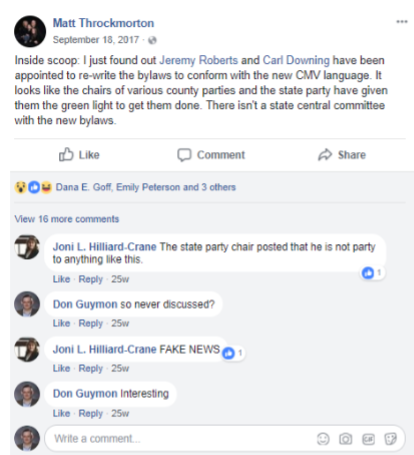 During the 2016 election cycle, Todd Weiler posted the following document into multiple Facebook groups to attack Johnathan Johnson in his race against Governor Herbert. The only difference is Weiler didn’t take time to scrub out the last four digits of Jonathan Johnson’s social security number, or his date of birth. 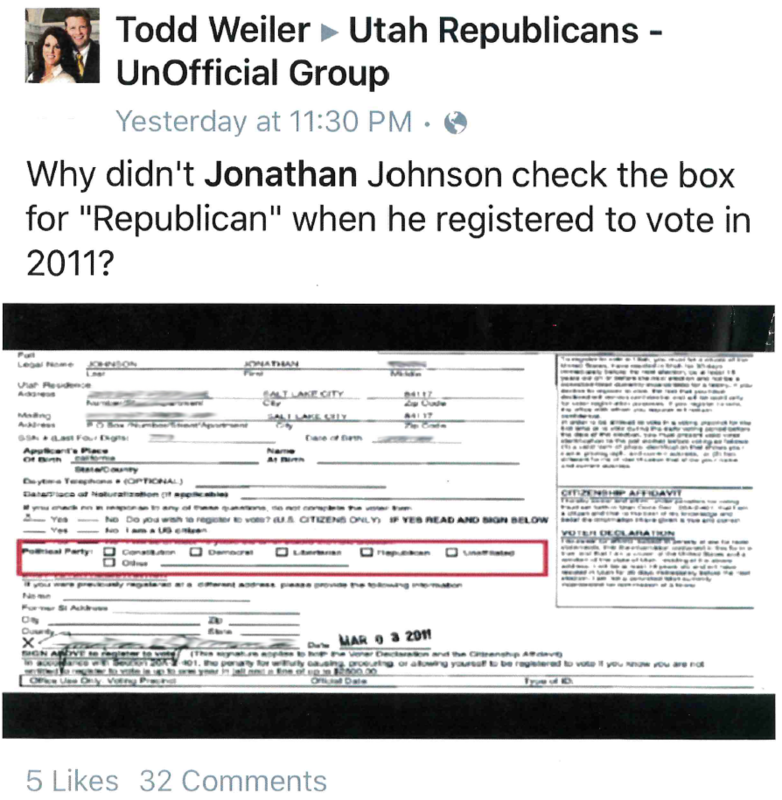 Weiler was trying to insinuate that Johnson wasn’t really a Republican because he forgot to check “Republican” on his driver’s license application (or voter registration card). Apparently releasing this voter registration data is a class B misdemeanor (Utah Code 20A-2-104-4-A-VI-D&E), not to mention a violation of privacy and criminal laws that prevent the disclosure of classified government documents. Police confirmed the only place the document could have been obtained was either from (a) The County Clerk’s office or (b) Spencer Cox’s Office (Herbert’s Running Mate, and fellow Buckshot Caucus Member). What penalty did Weiler receive for releasing this information? Zero, zilch, nada. After confirming the document was indeed a classified government document, the investigation was closed, no questions asked. Apparently if you’re in the Utah Senate, criminal laws don’t apply to you. Given Weiler’s history of political attacks against people, do you really think his attempt to get Bateman’s ex-girlfriend to make sexual harassment allegations against him were anything but politically motivated? If you believe Weiler’s motive was political, the Lehi Police disagree with you and found “no evidence of extortion whatsoever”, much like in the case with Jonathan Johnson. The Lehi Police department today announced they would close the extortion investigation into Todd Weiler. Police said they found “no evidence of extortion whatsoever” and would not pursue further investigation. How do you explain the comment they found “no evidence of extortion whatsoever“ when this audio file was provided to them? 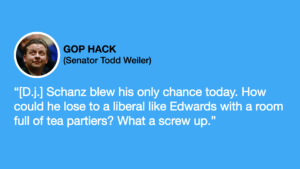 Senator Weiler must really have well-connected friends after all. A 30-minute recorded conversation was provided to police evidencing that Weiler told numerous lies over the Rod Arquette’s radio program regarding the extortion attempt. Testimony from the individual Weiler tried to seduce into participating in his scheme that (a) she never asked Weiler for help, (b) was not looking for an attorney, or (c) never even communicated with him, contrary to Senator Weiler’s false public statements. Evidence that showed Bateman didn’t barge into his employee’s home at 2 am to demand her phone, as Weiler falsely asserted. Evidence that showed Bateman was not engaged in an “affair” with his employee as Weiler asserted while publicly slandering him. Evidence that Weiler has been involved in at least one other clear-cut case of extortion, and possibly others (Police refused to receive the evidence). Evidence Todd Weiler had received ethics violations in Davis County. Evidence Todd Weiler had somehow shut down another clear-cut extortion investigation against him. Evidence Todd Weiler has harassed multiple people for political gain. 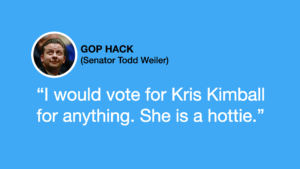 Evidence Todd Weiler created surreptitious social-media profiles to attack political opponents. 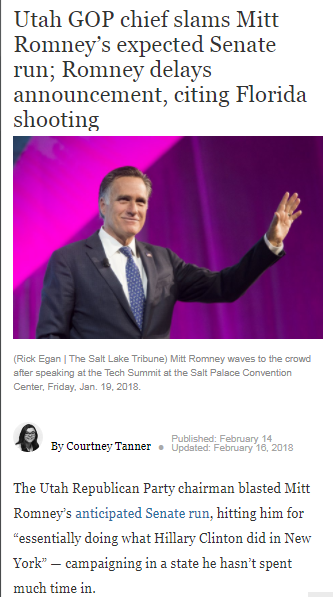 Only February 14, 2018, in a startling breach of his duties as Chairman of the Utah GOP, Buckshot-Caucus-Member Rob Anderson levied a harsh, public, and brutal attack against Mitt Romney via the Salt Lake Tribune. 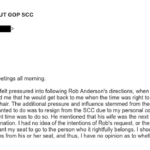 Equally concerning is Rob Anderson lied to the State Central Committee during the February 24, 2018 special SCC meeting, telling members of the SCC that he never made the reported statements to Tribune reporter Courtney Tanner. Tanner later confirmed she has an audio recording of Anderson’s comments, at which point Anderson stopped making the false claim. Listen to Rob Anderson’s accusations in a State Central Committee meeting accusing Tribune Reporter of fabricating Rob Anderson’s quoted statements. and international headlines, and they weren’t good. Desperate for a win to change the narrative away from the Romney debacle, Anderson turns to the last person you’d ever expect for help: Dave Bateman, the donor who recently bailed at the GOP who publicly stated that “Rob Anderson fought me at every step” while he was trying to pay off the Party’s debt. 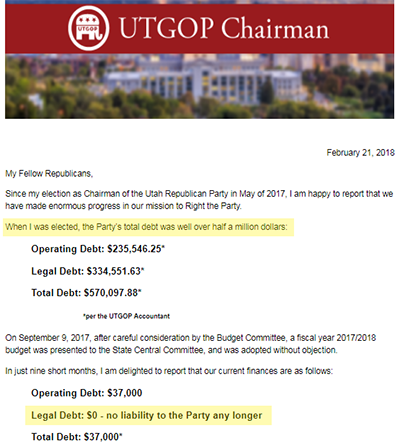 Desperate for a political win, Rob Anderson decides to send a bald-face lie to Utah Republicans just hours after Bateman tells him the debt isn’t paid off. Anderson wrote “When I was elected, the Party’s total debt was well over half a million dollars . . . In just nine short months, I am delighted to report that our current finances are as follows: Legal Debt $0 – no liability to the Party any longer. Notice Anderson takes all the credit for the debt pay off–not a single mention of Bateman. On April 3, 2018, after taking full credit the debt pay off, Anderson does a 180 degree turn and publicly attacks donor Dave Bateman, as well as the GOP Constitutional Defense Committee (“CDC”), by insinuating that somehow Bateman had pulled a fast one by “acquiring” vs “retiring” the debt. First, why would the GOP Chair attack the GOP’s biggest donor after he brokers a pay off of over $400,000 of Party debt? Perhaps a person who wants to bankrupt the Party. Second, the agreement Bateman and Anderson entered into is titled “DEBT PURCHASE AND LITIGATION FUNDING AGREEMENT“. How could Anderson claim he didn’t know Bateman was acquiring the debt unless he’s completely asleep at the wheel? Bateman agreed to acquire the Party debt and forbear collecting on Party debt as long as Rob Anderson honored his side of the deal. The terms were clear as day. Anderson inked the deal on January 10, 2018. Now for the real question. 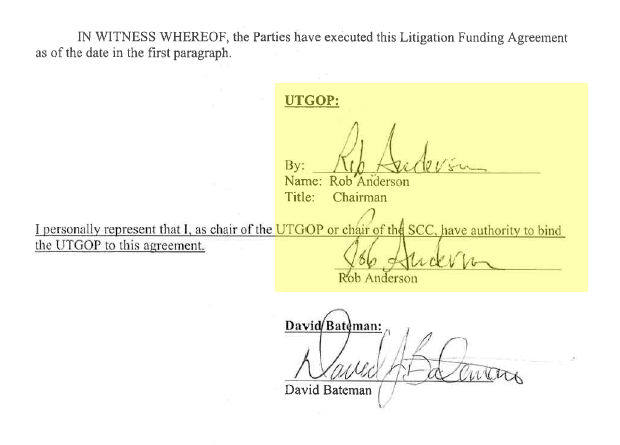 Has Rob Anderson honored his agreement with Dave Bateman? Or better, did Rob Anderson ever intend to honor the agreement when he signed it? The following press release was made today regarding the hiring of Gene Schaerr to represent the Utah Republican Party. Mr. Schaerr will take the reins in the GOP effort to overturn SB54, by filing with the 10th Circuit for an en banc hearing. Pending the outcome of the en banc hearing, if necessary, Mr. Schaerr will also represent the Party in soliciting the U.S. Supreme Court to grant a writ of Certiorari, so the matter will have a chance to be heard by the nation’s highest Court. Marcus Mumford has done a phenomenal job as Utah GOP counsel, but is not licensed to appear in front of the U.S. Supreme Court. However, his continued strategic involvement in the case is considered crucial to the overall success of the litigation. Monday April 2, 2018–Salt Lake City, UT. Don Guymon, spokesperson for the Utah Republican Party Constitutional Defense Committee (“CDC”), released the following. On Tuesday March 20, 2018 Utah Republicans learned that a split decision by a 3-judge panel of the Tenth Circuit Court of Appeals had ruled against the Utah Republican Party’s First Amendment challenge to SB 54, the controversial Utah law, “Count My Vote” (CMV), that dictates how Utah political parties must nominate their candidates for public office. Contrary to several recent public statements from SB 54/CMV supporters, this challenge is not over. A 2-1 decision, in which a respected Chief Judge, like Judge Tymkovich, writes a thorough and deep dissent, gives the Party a real chance to challenge the result and make sure the Court’s decision is consistent with the U.S. Constitution. Today, we are pleased announce that renowned constitutional attorney Gene Schaerr has formally agreed to assist the Party by taking the lead in seeking further review of this decision. The Party will soon be filing a petition with the Tenth Circuit asking all current members of the Court, not just the 3-judge panel, to weigh in. Mr. Schaerr is known for litigating before the United States Supreme Court and several U.S. Circuit Courts of Appeals (including the 10th Circuit). Schaerr earned his law degree from Yale, and bachelor’s degree from Brigham Young University. He previously clerked for United States Supreme Court Chief Justice Warren Burger, and also for prominent Supreme Court Justice Antonin Scalia. See more on Mr. Schaerr online at Gene Schaerr Bio. The history of this challenge is worth reviewing. SB 54 was passed by the Utah Legislature during the 2014 session. The Utah Republican Party immediately filed suit and won the first portion of our constitutional challenge, overturning an onerous stipulation requiring the Party to allow non-Republicans to participate in nominating our candidates. While we have not yet prevailed on the current challenge, which seeks to further protect First Amendment freedoms, Judge Tymkovich’s recent support should be heartening to all Constitution-minded Utah citizens. As Judge Tymkovich wrote last week, Count My Vote is a government mandate that “will generate different candidates…among whom are many persons who only nominally associate with the Party. Count My Vote understood that.” Such governmental interference in a private, voluntary association’s selection of its representatives is a flat violation of the First Amendment, as understood by those who wrote and ratified it. Thanks to the generosity of Party donors, no new Party resources are being spent on this legal challenge, and all prior legal debts related to this legal fight have been resolved. This enables us to keep the principled fight for every Utah citizen’s First Amendment freedoms alive, so that every Utah neighborhood has a real and meaningful voice in Utah politics. We call on all well-meaning citizens, including those who may have supported SB 54 and Count My Vote without understanding their First Amendment infirmities, to join with us. The best way we can move beyond the “divisiveness” and “strife” is to repeal or overturn SB 54 and return Utah politics to our neighborhoods and our founding principles. Author AdminPosted on March 29, 2018 April 4, 2018 11 Comments on GOP Chair Pulling A Fast One To Dissolve the SCC at Convention? Show Him Who’s Daddy! 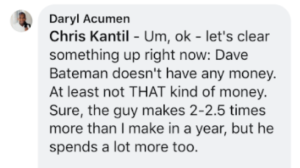 Dave Bateman has an update with respect to the extortion attempts he’s been subjected to by a member of Buckshot Caucus. Watch the video to the right if you haven’t yet seen what’s going on. 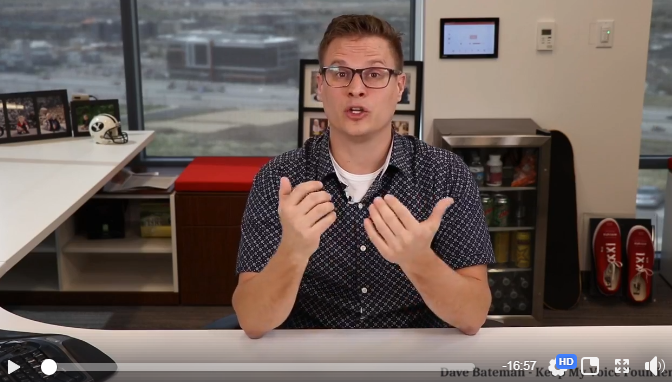 Dave is being extorted because he took a stand against “Count My Vote”. 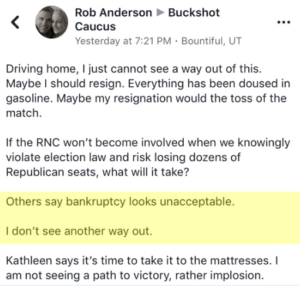 Over the past couple of months he has stepped forward to help save the Caucus-Convention System and rescue the Utah Republican Party from bankruptcy. Please listen. You won’t believe your ears when you hear this recording. If you want to help fight back against corruption in Utah government please share the video my Facebook live video, and use the hashtag #stoptheBS (buck shot) when you do. In fact, whenever you post anything political please start using this hash tag. Our elected representatives need to know we are done tolerating their corruption and we’re draining the swamp. Buck Shot Caucus is the epi-center of corruption in Utah politics. My name is Dave Bateman. I’m the CEO of Entrata—a local software company I started while at BYU 15 years ago. 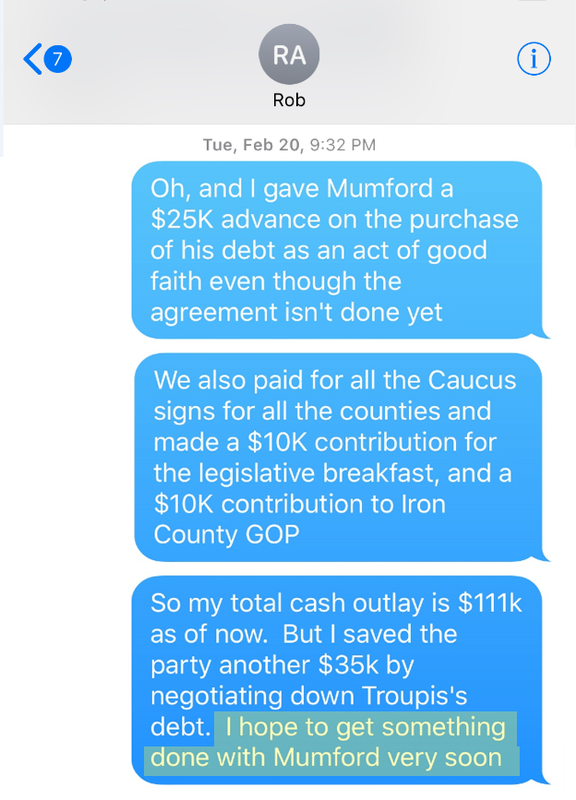 I’ve never been very political, but advocates of the Caucus System reached out to me a few months ago and asked me for my financial support to protect the GOP from bankruptcy, and to help preserve Utah’s Caucus System. I’m happy to report that I negotiated down, and just paid off the last portion of the GOP’s $400,000 in legal debts last night, leaving the Party on firm footing financially. That’s not why I’m emailing. I believe Count My Vote’s signature-gathering path will cause generational harm and corruption to Utah’s political environment. I’m emailing you to share a small glimpse of the corruption already occurring, which is what we can expect for generations in Utah if Count My Vote succeeds. 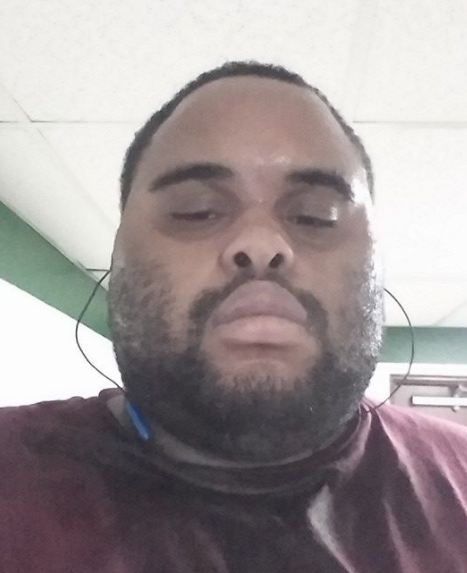 Because I bailed out the Party, those advocating for Count My Vote have come after me and my family aggressively. I went through a difficult divorce a couple of years ago, which my family is still fighting to recover from. Mysteriously, my “private” court divorce documents were somehow flagged as “public”, which only a Judge or Court clerk can do. Subsequently, a man named Daryl Acumen (who is a strong advocate of Count My Vote and appears to be a close confidant of GOP Chairman Rob Anderson) somehow obtained my private divorce court documents. The documents contain confidential information about my children and my finances, and sent them to a reporter named Ed Wallace. Despite sending a cease and desist letter reminding Daryl Acumen that distribution of these private documents is illegal in Utah, he continues to publish distorted information from the documents online. Count My Vote advocates have formed a group called “Buckshot Caucus”, of which GOP Chairman Rob Anderson, Rep. Mike Mckell, Senator Kurt Bramble, Lieutenant Governor Spencer Cox, and Senator Todd Weiler are members, among other prominent political figures in Utah. 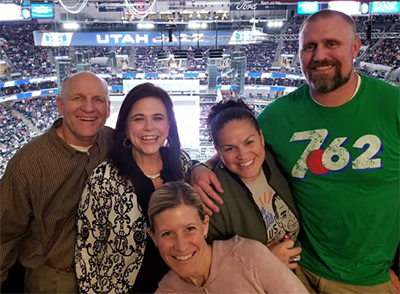 The group recently reserved a suite at a Jazz game and a member invited one of my employees to attend. My employee was approached in the suite by someone who was later described to me as a “political attorney”. The attorney asked her to participate in a scheme to solicit an employee of my company into making false sexual harassment claims against me. In return, the attorney allegedly promised the person who made the fraudulent claim a million dollars. I’m so thankful both employees who were solicited refused to go along with the dastardly plot and came forward to warn me. The media is in bed with Count My Vote because they will make millions from primary-election advertising if Count My Vote succeeds. The media is mischaracterizing those pushing to restore the Caucus-Convention System as a small group of fringe extremists. The legislature passed SB54 to protect their own incumbencies and ensure their re-election. Does it not seem sketchy to anyone that the State legislature decided to change the rules on how they themselves get elected? Yet the legislature who created this disaster joins in on mocking the State Central Committee for protecting their first amendment rights. Now, I can admit this video is kind of funny. What’s not funny is they ended the legislative session early, and didn’t have time to vote on a bill to protect QPP status for Republican candidates before adjourning; however, they had time to make this video and have a party to celebrate the conclusion of the session. The legislature, just like the media has been pushing an absolutely false narrative. I’ve contacted 140 of the approximately 170 members of the SCC. 101 of those 140 SCC members reported they are in favor of a single-path Caucus-Convention System. Every vote taken to attempt to restore the Caucus-Convention System passes with a super majority of support, whether it’s an emergency meeting or a special meeting. 120 out of 128 SCC members voted overwhelmingly in November to continue the SB54 litigation. 73.9% of 850 delegates who answered a survey I conducted want a single-path Caucus-Convention System. 80.9% of 1,000 2016 Caucus Attendees surveyed are also in favor of a single-path Caucus-Convention System. 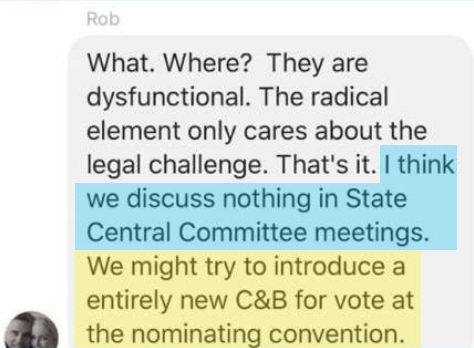 A member of the State Central Committee reported after the February 24 SCC meeting that his job was threatened if he continued to fight to save the Caucus-Convention System. Members of the SCC who voted on February 24 for the new bylaw have also been subject to electronic communications harassment. Count-My-Vote-affiliate Daryl Acumen has set up a process to bombard State Central Committee members’ email accounts with so many emails that they haven’t been able to communicate effectively during the weeks leading up to Caucus night. 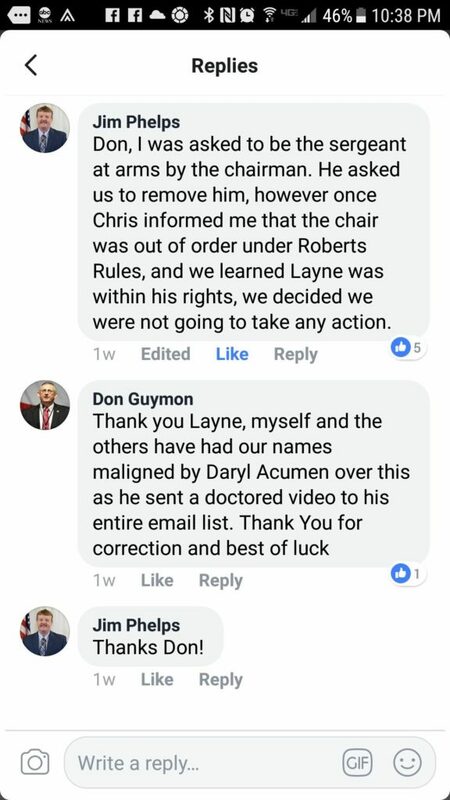 Acumen has spread lies all throughout the Utah GOP membership about actions recently taken in the meeting. During this same meeting, Chairman Anderson called for a closed-door Executive Session, wherein no recordings are permitted, nor are members allowed to even share the contents of the discussion outside the meeting. However, Chairman Anderson’s Assistant Executive Director Peter Simonsen secretly recorded the meeting from the Chairman’s lectern while he was standing there. The video was subsequently leaked to Daryl Acumen for use in his harassment of SCC members. The recent bylaw change was necessary to effectively litigate SB54. The Party bylaws have never allowed candidates to gather signatures. However, the existing bylaw needed an enforcement mechanism or it was meaningless. A bylaw change was made so candidates who violated the bylaws, after signing an agreement not to, would forfeit their membership until one day after the general election. Party attorneys cannot litigate against the encroachment of SB54 effectively without this. Moreover, any organization has the right to 1) define their rules and processes, and 2) to define them—especially a political organization. Count My Vote is terrified of this new bylaw, because it is SB54’s death knell. News articles were run to suggest the change would somehow interfere with Mitt Romney’s campaign, which is patently untrue. While the new bylaw was bold, it was only implemented in the 1st and 2nd congressional districts in 2018. These districts were chosen because no one had yet declared intent to gather signatures during this election cycle. 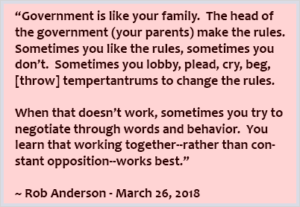 Unlike the false rhetoric from Chairman Anderson, the bylaw was implemented carefully to not bring harm to candidates, or change the rules on anyone mid cycle. After a super majority of State Central Committee members on February 24th voted to implement this new bylaw change, the Party’s Constitution and Bylaw’s Committee Janice Legler certified and signed the new bylaws. Officer Lisa Shepherd did also, and emailed the bylaws to the Lieutenant Governor’s office, as the Party is required to do by law. The new certified bylaws were published to the Party website utah.gop. This is where things start to get weird–and I mean weird. 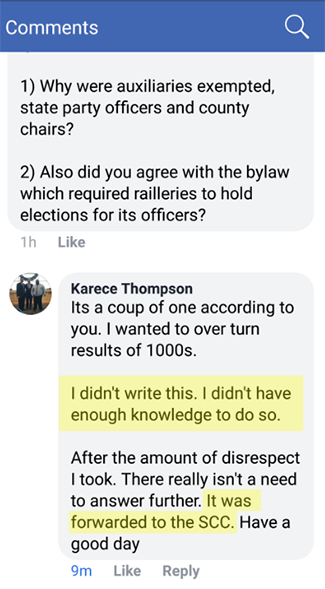 The LG’s office refuses to accept the bylaws from anyone besides Rob Anderson, stating “We will need to receive these bylaws from him.” No one in the Party ever remembers the LG’s office refusing to accept bylaw changes from the Party secretary. 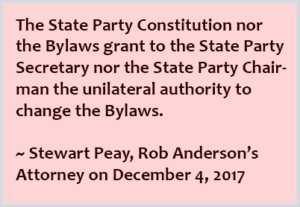 Outrageously, Chairman Anderson edits the certified party bylaws himself and submits a fraudulent and uncertified copy of the bylaws to the LG’s office omitting the new bylaw passed by a super majority of the SCC. See Anderson’s edits here Brazenly, Anderson apparently also made edits to elements of the bylaws changed as far back as 2015. The Chair clearly does this in an attempt to thwart the Party’s attempts to litigate SB54. 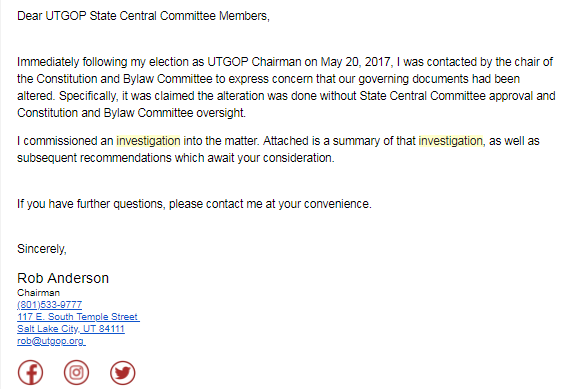 While the LG is in Buckshot Caucus, to be fair, the referenced correspondence was with Justin Lee, the Director of Elections, not Spencer Cox. Please consider running to become a County delegate this year if you’re a proponent of the Caucus-Convention System. County delegates selected this year will vote to elect a new State Central Committee next year. We have to get organized or we will lose this fight. Please visit KeepMyVoice.org to volunteer to be part of the coalition to preserve and protect the Utah GOP’s First Amendment Rights.